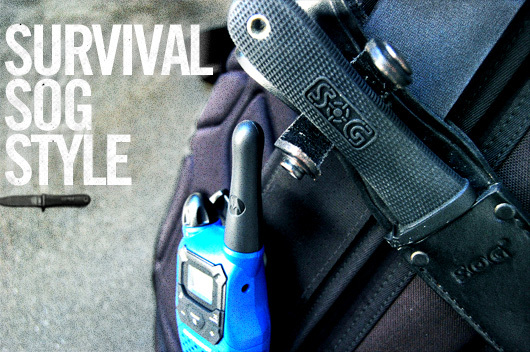 When you need something sharp for your survival kit, look no further than SOG. From hacking through the jungle to packing an entire toolbox in your pocket, we pick the right tool for the job. By now you're hopefully becoming comfortable with the idea that owning a knife is not just a good idea generally, but it's an absolutely essential part of preparing a survival bag. When I talk about survival, most often I'm talking about some end of the world, you're stuck out in the woods stuff — if you're prepared for the worst, anything less than that is a piece of cake. That said, like always, forethought is key. Do you live near the woods? The desert? What kind of terrain will you be covering? If you're going hiking, this may be completely different than where you live. A trip to Alaska is the polar opposite of a trip to Australia – literally and figuratively. Only you know which tool will best suit your needs – and if you've got the cash you might be interested in buying lots of tools for lots of situations. That's the camp I fall into. In my never ending quest to find the best, brightest and sharpest, I decided to give SOG, a well-known knife manufacturer, a test and found three units I absolutely adore. My first experience with anything SOG was a multitool gifted to me by my Uncle, who had a few Army surplus units. I kept that multitool around for years (okay, actually I still have it sitting on my desk) and it was one of the finest I had used. It was compact and light, but had just about everything I needed in it. About a decade later and SOG is still at the top of the multitool game with their SOG Powerlock. It's a good bit heftier than my last multitool, but that's what happens when you cram it with features. The Powerlock features a thick pair of scissors, a myriad of screw driver heads, bottle and can openers, a file, needle point, half serated knife, needle nose pliars, wire cutters, ruler, blade covers, and a locking/release mechanism. Also of note is the double toothed saw, said to cut twice as fast as most pocket saws and the compound leverage gears, which effectively double your gripping and cutting power over normal multitools. The smooth acting gears allow for one handed opening with a flick of the wrist, and the durable unit comes with pouch/belt clip combo for ease of carrying around. A multitool is a great thing to carry everyday to handle a variety of situations, but when you're creating a survival bag, you should save some space for something like this – it has a dozen specified uses and who knows how many improvisational ones. Straddling the line between knife and machete, at first look the Jungle Primitive conjures images of Rambo and lush jungles. With a blade 9.5″ long and a total length surpassing 15″, this is a whole lot of knife. In fact, it's so much knife that you might wonder why you would need it – again, I stress location and function. Large knives were the norm for much of our history because they're useful. You can skin animals, hunt animals, chop wood, and cut your way through brush with a big enough blade. To make it even more useful the Primitive has about two inches of serrations on the blade and six inches saw teeth on the back, giving you cutting options to preserve the slicing blade. You don't really want to use a sharp cutting edge to cut wood if you can help it, especially in a survival situation where sharpening your knife may prove difficult. What makes this knife stand out from the crowd is the Kraton digi-grip no slip handle and the supreme balance. I've handled pretty big knives and I can say that this one balances better than most. The weight sits forward of the hilt, giving it excellent chopping ability and the heft needed to saw through tree limbs. Unlike a machete though, the weight isn't too far forward, which means you can do more delicate work with the knife as well. The sheath features a utility pouch, belt loop, and single snap closure. The knife, for its size, is remarkably light and sits very well in the hand. 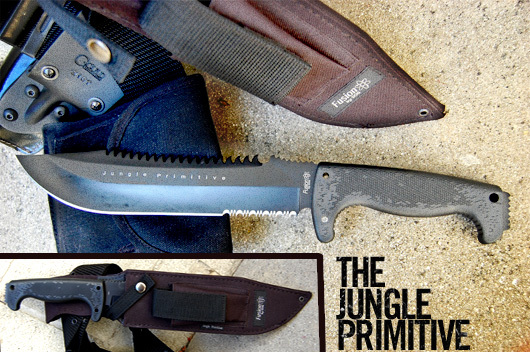 If you're in a heavily wooded area or jungle/everglades type area, the Jungle Primitive might be the knife you're looking for. I mostly recommend fixed blade knives because they're stronger and more reliable than folders, though sometimes fixed blade knives can be a bit overwhelming in either length or weight. For the perfect balance of size and ability, my favorite knife that SOG has to offer is the NW Ranger. Under ten inches long, the Ranger packs a 5.2″ non-serrated blade and weighs in a hair over 6oz. Slipped into the included leather sheath and you can carry this knife all day long and never think about it until the moment you need it. Sharp as hell right out of the box, the Ranger feels deadly in the handle. It handles well and moves quickly with a balance point just shy of the bolster where a thick rubber finger guard keeps your digits safe from the sharp edge. The Kraton handle is textured rubber which offers a sure grip in all conditions, even soaking wet. The blade itself is made of AUS-8 steel, an excellent material at this price point because it's very easy to sharpen and retains its edge under heavy use. The Ranger handles anything thrown at it and, unless you're trying to shave rocks, normal use won't wear down the knife, making it the perfect utility blade. You could easily use the knife to harvest an animal whether you're hunting or in a survival situation, but the blade is sharp enough to make quick work of fish without massacring the tender tissues. With it's great midsize length, it's a blade you'll reach for time and again in the field, whether you're cutting tinder, fishing line, or preparing dinner. 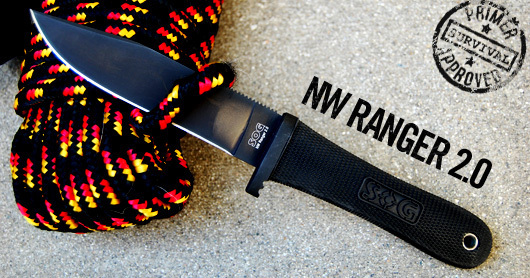 Out of everything SOG offers, I'd definitely go with the NW Ranger. The model I reviewed had the Black-TiNi coating on, which I actually might advise against. With normal use and handling, it seems that the oils from fingertips can wear down the coating fairly quickly, though this is really just a cosmetic concern, but it's worth mentioning. That aside, the Ranger is a great length and weight that feels excellent in the hand. This is a great utility, every day belt knife, or the perfect addition to your survival pack. Do you have a favorite knife or any experience with SOG? Keep the conversation going in the comments. I’m a southern girl who never thought to own anything other than a tiny Swiss Army knife, but hands down the best gift I’ve ever gotten was a SOG Flash II Tanto from my Father. He engraved my name in the blade and I can’t think of a week in the last 3 years where I haven’t used it! Truely a great everyday blade. I’ll never be with out one now. Also you’re right the NW Ranger is great, it’s in my emergency kit of my Jeep! SOG makes great knives (especially their fixed blades), the AUS8 steel used isn’t top of the line but it get the job done. I currently only own one SOG knife (a Flash 1), the handle design isn’t the greatest but the blade shape is perfect for an all-around pocket knife. If you’re looking for a great pocket knife, my favorites are mostly from the Spyderco brand; I know a lot of that is personal preference but they’re definitely worth looking at if you’re interested in a quality folding knife (they have fixed blades but they’re really expensive for what you get). Also, I’d recommend against getting a SOG jungle primitive if you’re planning on using it, for a couple of reasons. First, the knife isn’t as functional as you might think; the serrations on the back side of the blade (spine) serve no real purpose (it might look like a saw but it doesn’t work as one), the blade is too thin to handle heavy-duty cutting/hacking, and the size of the knife is an uncomfortable – and unusable – in between size that is shorter than a true machete and longer than a useful knife. Bottom line, there are better options depending on what your needs are; Condor makes fantastic machetes (Gerber does too, if you’re not willing to shell out big bucks) and if you want a “survival knife” that will actually help you survive, check out the KABAR Becker series of knifes. Mora also makes good knives, if you’re looking for something that is strong, cheap, and light enough to not weigh you down. If you’re one of the few lost people reading this ancient post and you have any questions about knives or need recommendations, I’m not an expert but I do have some experience with a variety of knives and would be happy to help you out, just respond to this post.